Feliz Feel Good Friday! It's Cinco de Mayo so we're going to highlight an organization in Puerto Vallarta, Mexico - Biblioteca Los Mangos! Their mission is to ensure that people in the community have access to high quality general-interest information and technologies so they may use them to learn, grow and develop. The vision is to promote the habit of reading as well as preserve cultural traditions within the community. 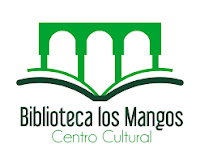 Biblioteca Los Mangos has over 30,000 books in Spanish and English and offers 4,500 individual services per month. Their spring cultural classes include ballet and folk dancing, singing, yoga, art history and manga drawing! They also have an ongoing program called APAPACHO. It's for parents with children 2-3 years old and focuses on nourishing their creative and mental development. Last, there is a local market on Saturdays located in front of the library where you can buy fruits, vegetables, baked goods, clothing jewelry and crafts. All while enjoying live music and entertainment! If you're planning a trip to Puerto Vallarta you can visit in person. If not, you can visit via this video and stay in the loop by liking their Facebook page and following them on Twitter @BibliotecaPVR. Adios!